Tsukubasan Plum Garden (筑波山梅林, tsukubasan bairin) is Japanese plum garden located on Mt. Tsukuba. There are over 30 kinds 3000 Ume, Japanese plum, trees. 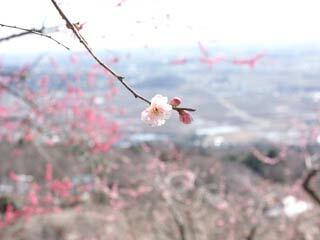 From the end of January, Ume starts blooming and in the middle of March, all of the Ume blooms. It has great view of Kanto Region as the back ground. There is parking. Admission is free. During the middle of March, there is Ume festrival and you can drink free Ume tea, and demonstration of Gama Oil. Also, there is the shop which has all local food and products from Tsukuba city. There is observation stand on the top of the hill with you can enjoy Ume and great view of Kanto region with sometimes with Tokyo skyscrapers and Mt. Fuji, if the air is clear. Best to visit around middle of March (Depend on the weather of the year).